As a follower of the Scottsdale Culinary Festival and its affiliated events for the last ten years, I was excited when they debuted the first Burger Battle in 2012. I mean, who doesn’t love a good burger?! The concept: bring together the best burger producers in Arizona, have them duke it out by preparing their best burger on site, and have two separate awards – The Judges’ Choice (determined by a juried panel of professionals) and the People’s Choice (determined by event-goers). This year, when invited to attend as a contributor for Write on Rubee, I jumped at the opportunity. There were sixteen competitors in attendance this year, a diverse group from around the Valley, and even as far as away as Sedona (Mariposa Latin Inspired Grill) and Cottonwood (Bombaz Grill). I have to say that my expectations were not that high, only because my experience in attending food events most often leaves me a little disappointed, wishing that dishes were a little more thoughtfully prepared. Well, this one did not disappoint and I was pleasantly pleased with the offerings. I was not able to taste all sixteen burgers; I had to tap out at nine (even with only having a bite or two of each). There are only so many burger bites a girl can eat, even with her stretchy pants on. I must have chosen well because I was thrilled at the quality dishes from all but one of the nine. I opted out of eating the Donut Burger from The District. I love a good donut and I love a good burger, but a burger bun made of donut… I just couldn’t wrap my head around it and knew I needed to portion out my calories wisely. This one was a pass. And also in the spirit of utilizing my bites wisely, I’d previously eaten the Super Farm burger so decided to concentrate on morsels that were new (to me). Every time I walked by Caveman Burgers, either the line was long or they didn’t have any burgers prepared, so this was another one I missed. And for no particular reason other than hitting the wall on what I could consume, I also didn’t try the burgers from Handlebar Diner, The Bevvy and Bombaz Grill (which I was later told was a mistake to pass up). I lucked out by starting at Aioli Gourmet Burgers. Their “Legend of the Hidden Temple” burger included American Kobe beef, grilled pineapple, togarashi aioli, apple-wood smoked bacon, crispy wontons, arugula and shaved red onions (as an aside, I only remember all this because they had a sign with all the ingredients, something I wish more restaurants would do at food events – I love easy access to getting more information). It was a quarter of a full-size burger with a teriyaki-like flavor. Not the prettiest of the bunch but what it lacked in beauty, it made up for with its balanced combination of textures and juicy, well-seasoned beef. Although it was a really great start and a perfect way to whet my whistle, it set the bar pretty high for everyone that came afterward. Next up, Cold Beer and Cheeseburgers also served up a quarter of a full-size burger, which was stacked with a perfectly cooked, thick, medium-rare beef patty, huge chunk of tomato, bacon and lettuce. It was simple and good. Alto Ristorante at The Hyatt Regency Scottsdale presented a slider-sized burger that, although delicious, was a little strange with the dusting of powdered sugar on the top of the bun. Another burger with bacon… a concept that didn’t disappoint me at all but instead became a satisfying trend of the evening. The line for Four Peaks Brewing Company was long but worth it. When I reached the front, they were just pulling the next batch off the grill. 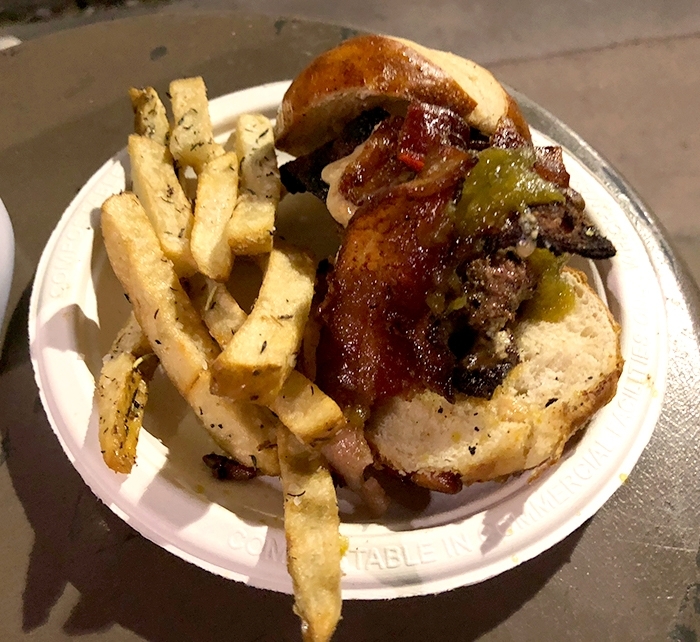 Not many of the offerings had accompaniments, but I really enjoyed the fries that Four Peaks served alongside their slider with bacon, cheese and pickle. It also perfectly paired with my beverage of choice, Four Peaks Kilt Lifter Ale. I was starting to see why this event is so popular. These folks were not phoning it in but instead served up quality beef in thoughtfully conceived dishes, and perfectly prepared to medium rare (this was across the board for all nine burgers I tried). The chatter around the tasting tables was that Aioli Burger was definitely a crowd pleaser and that Mariposa Latin Inspired Grill was a burger not to be missed. Although I’d previously been to Hopdoddy, I had not tried their choice of burger for the night (and it was another long line well worth the wait) – the Llano Poblano, a tasty slider-style burger that I had a difficult time putting down. The burger consisted of Angus beef, pepper jack cheese, roasted poblano chiles, apple-smoked bacon and chipotle mayo. I have to confess that I ate more than my allotted two bites and hesitated to throw away the remaining couple of bites but I knew I had to move on and save some room for more. I powered through, knowing I had to try the popular Mariposa Latin Inspired Grill “Funghi Sublime Burger”. Served by the legendary chef Lisa Dahl personally, this delicious burger was well seasoned and featured an inspired focus on umami flavors with the truffle aioli and sautéed mushrooms. At this point, I have to confess that I was getting very full. I knew I was running out tummy space and figured I had better find a way to get a few more bites in. 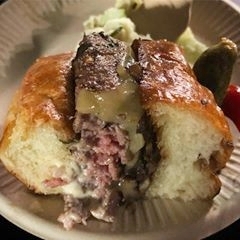 I was happy with the Hand Cut Burgers and Chophouse slider-style course that featured a fresh-baked honey brioche bun, Arizona grass-fed beef, bacon jam, burrata, pickled jicama-pepper slaw and local hot sauce aioli. This one was difficult to eat because it was so tall but I appreciated the balance of creamy aioli and burrata, with crunchy bacon, and the acidic contribution of the pepper slaw, a valiant effort in a sea of deliciousness. The only miss of the night for me was the Asadero Cocina + Cantina Wagyu Beef Carnitas Slider with spicy slaw and chipotle ketchup. I didn’t understand what the meat was supposed to be… was it beef or pork (carnitas is traditionally pork)… a combo perhaps? Although their burger from last year was the Judge’s Choice Winner, this year’s burger was overly salty and, unfortunately, just didn’t work for me. One bite and it was time to move on. I knew I was out of room but I wanted to try one more burger so I wouldn't end on a sour note. I concluded my gluttonous journey with Arizona Wilderness Company. Another perpetually long line of the evening, I was glad I didn’t stop at the previous sampling. The long line gave my bursting belly a chance to digest and make just enough room for a couple more bites. I welcomed the thick-sliced bacon with spicy peppers that topped the burger and the accompaniment of thick-cut chunky French fries. This was a great way to end the night and I decided to quit while I was ahead. The Burger Battle was a value at $65, which included as many burger bites as you wanted, along with two dessert stations and beverage tickets for beer or wine. The competitors took the competition seriously and gave event-goers delicious offerings. As part of the overall Scottsdale Culinary Festival, the Burger Battle is a definite don’t-miss event, and I will definitely return.